For a while, ba.com has been promoting British Airways American Express cards to random visitors during the booking process. Whilst this is a perfectly logical time to try to catch a new customer, the sign-up offer is deliberately poor. BA is offering you £50 and 6,000 Avios for signing up for the Premium Plus card during the flight booking process. The problem is that the current public offer is 25,000 Avios as you can see here. If you value an Avios at 1p, you are getting a sign-up package worth £110 via the ba.com offer compared with £250 via the usual offer. The only difference is that you do not have to spend £3,000 to receive the bonus if you take the ba.com deal – but if you can’t spend £3,000 in three months then you shouldn’t be getting this card, as it means you are unlikely to trigger the 2-4-1 voucher. Whilst BA is free to offer whatever deal it likes through whatever channel it likes, what does it say about an airline that is basically trying to fleece people who have just spent money with them? And what will the customer think when he finds out? What everyone assumed was a ‘done deal’ – for BA’s parent IAG to acquire the Austrian low cost carrier NIKI from the wreckage of Air Berlin – has fallen through. The original deal collapsed after the German courts allowed the insolvency process to be moved to Austria. This gave other bidders a period to revise their offers, and Niki Lauda – ex racing driver and the original founder of NIKI – was successful in the second process. You can read a full report on Reuters here. Stobart Group, owners of Southend Airport, announced yesterday that they are reopening Carlisle Lake District Airport to commercial flights for the first time since 1993. Flights will begin on 3rd June. Exact routes are not yet known but the airport talks of connecting “major tourism and business hubs including London, Dublin and Belfast”. It doesn’t say which London airport but logically it would be Southend given that Stobart Group also owns that. Stobart Air currently operates some flights under a Flybe franchise deal so it is possible that this may be used here, meaning that the flights will be bookable with, and will earn, Avios. Stobart also operates some flights for Aer Lingus so it is possible that brand may be used for Dublin. 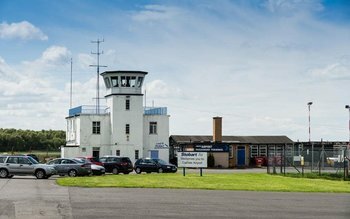 The airport is located six miles east of Carlisle and 20 miles north east of the National Park. It is currently used by a number of general aviation flying schools and an aircraft maintenance facility. Rob… how did you manage to misspell Niki Lauda’s name on two counts when his first name is in the airline! I actually saw it spelt elsewhere as ‘Nikki’ and did note that it was odd it was different, but I assumed that it looked better painted on a plane with just one ‘k’! Early OT. I’m thinking about cancelling my 2 4 1 CW booking for August and re-booking with my Lloyds upgrade voucher (there is plenty of availability). If I do, am I right in thinking I will receive back the 2 4 1 voucher, the avios and cash “taxes” on the original booking (minus £35 pp cancellation fee)? Just to clarify, it’s a one way trip and the Lloyds voucher expires much sooner. You are correct. If you canc, your 241 booking you will get everything back except £35pp cancellation fee. I’ve now re-booked and cancelled so briefly held 6 CW tickets for August – proving that reward availability in peak season can be very good if one is prepared to be flexible with destinations! Did the seats you cancelled reappear? Washington DC. I don’t know if the seats have reappeared as it didn’t say how many were available to start with, which I assume means there were a lot as otherwise it states that there are 6 available or whatever. OT: Have people received the 1000 VF auto convert for this quarter? I haven’t and it’s quarter end soon. IIRC there were numerous reports of it failing last quarter so perhaps FC have tightened up on it. No. I turned off autoconvert about a week ago. IIRC the collection period has ended / ends v soon. I just logged in and it said 1 more day to go…. just just stopped the auto convert as the Mrs wouldn’t of been too happy that i just traded her £52 worth of vouchers in to 12k VS miles. Haven’t seen mine this quarter either. This has happened in the past and then been OK again the next quarter. Yeah, my local airport (but it’s still a 50 mile drive away)???? OT: following on from yesterday, is the 6 months wait for a new Amex MR card 6 months from the card closure dates, or six calendar months in between, or… I closed my card on July 16th, so I’m wondering if I’m safe to apply again. I wait 6 months and a day so you should be fine. Is it true that you have to wait longer if you still have MR points in the account? OH and I have both closed accounts recently with about 30 points we couldn’t get rid of. In the past I have left tiny residual MR balances in the account when couldn’t be bothered to transfer to Nectar. Had no effect next time round. OT: There were a couple of reports on here yesterday of people starting to receive the bonus Hilton points re the (targeted) MR transfer bonus. Mine have still not come through (transfer initiated 8 Jan). Can eligible people post transfer date and simple yes/no as to whether bonus now received below, by way of a quick survey? Thanks! No. I’ve not received the 50% bonus yet. I made the transfer on 18th Jan. I was offered 30 000 avios directly from BA via an email. I already have BAPP. I guess I was “lucky” except it was no good for me. I got fleeced by this “offer”. I had been considering taking out the BAPP card for a while and as I was booking some expensive BA flights, when towards the end of the booking process was offered the card. I clicked through but decided not to apply at the time because of the poor offer. I latterly applied via other means to obtain the 25k Avios but only received the 6k + £50 credit. When I complained they said it was something to do with the the cookies left on my device and refused to correct it. Livid does not come close to describing how I feel about the process. I would be livid too. Did you have any proof of the better deal, e.g. screenshots? Though I am very aware that BA are a nightmare to get to budge on anything! But did you complain to BA or Amex? It’s an Amex application process/cookies and they are usually helpful so I’d try them if it was BA you tried the first time. Why? BA will have created the offer and is presumably being paid much of the difference in value between the two bonuses. Because Amex tracks cookies during their own application process, surely? They track cookies so they can pay BA for the application. … I mean, they said they applied using the Amex 25k offer, and Amex recognised old BA cookies. This isn’t BA’s problem. You’re livid because of your inability/unwillingness to understand how cookies work and/or read the T&C in which you gave permission to be tracked (all EU websites show you the T&C box)? Words fail me. It’s a really simple process to delete cookies and start again. That’s a bit harsh… not everyone maybe as IT savvy as you, and most people can’t remember the sites they visited yesterday, let alone a days or weeks ago. I fully understand how Cookies work and for the purpose of click-through advertising it is always last cookie wins. Having worked within FS and Internet Media buying for over a decade I also understand how difficult it will be to get BA/Amex to accept the issue was their’s. Maybe you should consider taking some time to understand how Cookies work. North west? Flying from the north east is hard enough as I remember as a youngster with no money. I once did Amsterdam via Exeter (obvious routing!) as the cheapest option with Flybe. OT but are Virgin redemption bookings as flexible as British Airways ones? Can the dates be changed/booking cancelled? I cant work it out from their small print easily or even find out from searching HFP articles. Yes – for a small fee, as with BA. Call them to check if in doubt. We’ve cancelled VS UC reward bookings and received miles and cash back minus fee. That is pretty much what was mentioned on the local TV News last night. No mention of Stobart Air, but it was pointed out that Stobart own both Southend and Carlisle these days. It was also mentioned that CAX-DUB would be good for connecting to the USA, with pre-clearance in DUB. No mention of reduced APD, though. OT – I’m plat, can I refer myself for SPG? How many points will I get? Nice. Holding on to the Plat instead of cancelling looks like it will turn out to be a good move. All Hiltons give free breakfast for gold. The best one really depends on what you want to pay and what you are looking for. Thanks John. To clarify, this will be a booking using points for 1 night and free vouchers from the credit cards for the other 2 nights so cost not really an issue. I had been thinking the Conrad but based on your comments maybe the Morrison is better? We want something central really. One caveat – sometimes the free breakfast is just a continental one and not full buffet. I got full buffet in Brussels City but just continental in SF Financial District. At SF I was told I could upgrade to full breakfast for $10. I did and when finished they said they wouldn’t charge me the extra because I hadn’t eaten a lot. Are you saying Waldorf Astoria don’t do free breakfast for golds? That’s correct but there aren’t any in Dublin to my knowledge. Since 1st January 2018 you have a choice of 1000 points or free breakfast (at least continental) as gold, or points and breakfast as diamond, at Waldorf Astoria. Sounds like a toss-up between the Conrad and the Morrison…anyone else any thoughts? Both 4.5 on Trip Advisor! I’ve stayed at the Westin many times and enjoy it although the rooms are small and it’s quite a fight for any SPG status upgrades here as they are often sold out. I also stayed at the Conrad once and the location didn’t seem as good,.the rooms were fine although no upgrade as gold. Thanks Andrew. Think I’m going with the Morrison! Stayed at both the Conrad and Custom House. If you are using free night vouchers I’d recommend the former. It’s been renovated in the last couple of years and we recently enjoyed a visit there a couple of weekends ago. Slightly obscure recommendation but the Irish Black Pudding for breakfast is very tasty. For a cash booking, the Custom House HGI is good value with a decent breakfast. I’ve triggered the 2-4-1 voucher and this has appeared on my BAEC account but I haven’t yet used it. If I cancel the BA Amex before using the 2-4-1 voucher will it disappear? Also worth noting that customer services will tell you that you will lose it contrary to what actually happens. O/T So as a Platinum Amex, I can refer myself and others for SPG amex, and earn 18k MR points, then just cancel the SPG card when it arrives?! why cancel it straight away? its only a 1k spend to get the 11k star points, which gets you a night in a reasonable hotel? I’m really starting to see the benefit of star points. even if it takes you a month then thats only 6.25 in fees. I hear you Mark. Just never really collected hotel points. Avios flights using 241s has always been my end game when collecting. With a young family, and wanting a suite when staying at hotels, redemptions seem too tricky to benefit us at hotels we want to go to…..
SPGs also transfer to Marriott who do Suites / large rooms (eg Domes) on points. See the article yesterday. You still might as well collect the starpoints and you can convert them into avios if you don’t want to use them for hotels. All very valid points! The maths seems odd to me though…. 1 SPG is 1 Avios. That works. But 1 MR point = 0.5 SPG points. So I will need 100k MR points to convert to 50k SPG points to get 2 rooms for one night at the Westin Dubai for example. That totals 700k MR points for a weeks holiday for my family. Leaves me to think moving SPG to Avios is only sensible use of Starpoints. Use them for flights, pay cash for hotels…. Thanks Genghis. much appreciated. I can see benefits of this. Marriott Travel packages deffo. Just a shame the 1 SPG -> 1 Avios exchange can not be done both ways….